It was sometime in my second trimester when my friend Lucy first served these brownies to me. These brownies were so amazing that eating them was one of my favorite pregnancy moments, not too far behind feeling my baby kick inside me, or seeing my baby’s heartbeat for the first time. At first I thought it was just the hormones speaking. I mean, I did just have chocolate macarons and the Chili’s molten lava cake the day before. But I could not get them out of my head. So I immediately got the recipe from Lucy and raced home to make another batch. And yes, they were the best brownies EVER. Preheat oven to 350° F (180° C). Spray 13×9 in. pan with nonstick spray. In small bowl, combine flour, baking soda and salt. In small saucepan, melt butter and sugar with water; stir until sugar is dissolved. Add 2 cups chocolate chips; stir until melted. Remove from heat. Stir in vanilla. In large bowl, beat eggs with electric mixer. Add chocolate mixture; mix well. Add flour mixture; stir until just combined. Stir in remaining 2 cups chocolate chips. Spread batter in prepared pan. 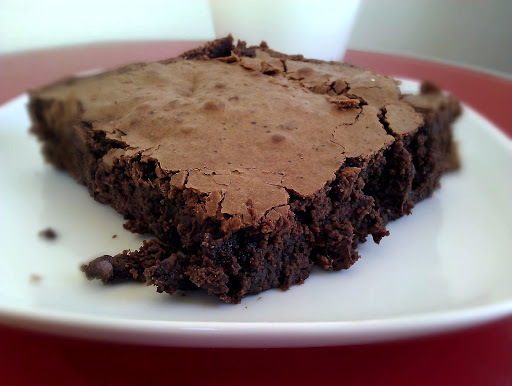 This entry was posted in Desserts, Vegetarian and tagged Brownies, chocolate, Desserts by thepantrydiva. Bookmark the permalink. Ohhh I love these! They ARE the best brownies ever!